I didn’t have internet access in the field, so this dispatch is actually coming from my living-room in Sydney! 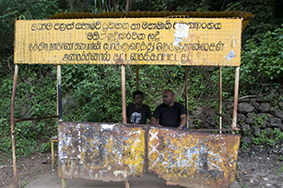 I have just returned from a field trip with Ruchira Somaweera to the Knuckles Mountain range, which is to the north of Kandy in central Sri Lanka. Ruchira is the famed author of “Lizards of Sri Lanka”, available from Chimaira (you can thank me later, Ruchira). 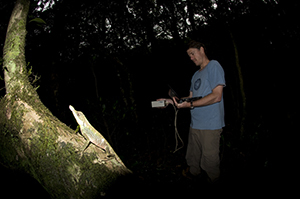 We focused our efforts on a single species of lizard, the Leaf-nosed Lizard (Ceratophora tennentii). Sri Lanka has an amazing diversity of colourful, horned lizards. Our goal is to understand some of this diversity in the context of sexual selection and communication. 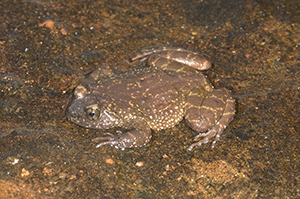 Given that our time was short, we worked on a relatively common rainforest species, or so we thought. There were days when we searched the forest high and low, only to find a few individuals. Fortunately, we also had good days when we found 15-18 individuals and in the end we sampled 35 males, 28 females and a number of juveniles. Given that males fight, we hoped to stage contests to test whether colour and body size are indicators of male quality and predict contest outcome. Unfortunately, this species is only really happy to fight in the comfort of their own territory (we tested this in the field) and the problem with this approach is that home advantage trumps the traits of interest (colour and body size). Its a bit like the effectiveness of the Indian cricket team when they play in India as opposed to in Australia (apologies to N. American readers!). We therefore abandoned this part of the study and focused on quantifying the colour of both males and females. We measured the spectacular yellow throat and some less interesting colour patches on the outer body. We also measured some colour patches in the mouth and discovered a patch of UV on the roof of the mouth and interestingly, that the tongue is UV-orange, albeit somewhat weakly UV. Finally, we measured head and body size and bite force, which can be important in male contest competition. When we analyse this data, we will test whether any aspect of colouration predicts bite force. We will also examine the differences in bite force between males and females and test whether head size predicts bite force. The rainforest in this area was pretty amazing, but it also presented a new challenge for me: leeches! There are places where you can literally see them marching across the forest floor. These leeches are long and slender and move like an “inch” worm, but at rapid pace. Fortunately, I was introduced to leech socks, which you wear over your socks and pants, but in your shoes. These kept out the majority of leeches, but invariably some get past you (see photos below). I had about six attach themselves to me at various stages. Typically, you realise too late that a leech has just dined on you. Once full, it drops off you and the anticoagulant nature of its saliva results in a rapidly enlarging patch of blood appearing on your clothing. 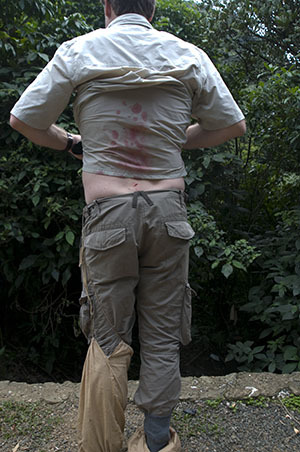 If leeches make you squeamish, avoid Sri Lankan rain forests! 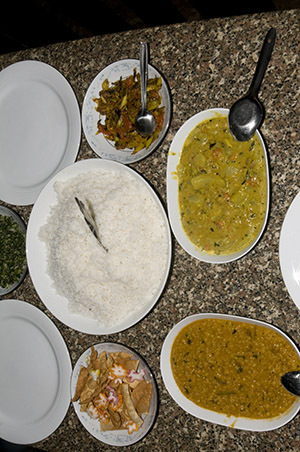 A big advantage of working in Sri Lanka is ofcourse, the fantastic curries! We were incredibly spoilt by the cooking team of Chandra and Vinoj, who prepared multiple delicious curries on a daily basis. 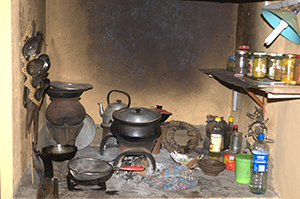 They were happy to allow us in their kitchen to witness their craft and to record their recipes. I already miss them! 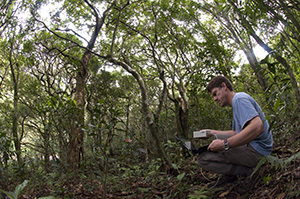 On our last day in the field we drove to Wasgomuwa National Park, a few hours to the north. 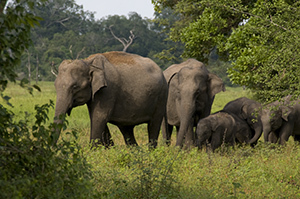 Here we saw four small herds of elephant. Having previously seen lots of African elephants, what was striking is the small size of the females and the near absence of tuskers. What was also a little bizarre for someone accustomed to the African savannah was seeing elephants in the company of peacocks and Sri Lankan jungle fowl (basically, wild chickens! 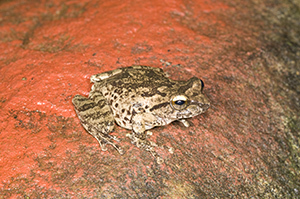 ), both of which are native to the region. There were lots of other interesting sightings. We saw mugger crocodiles, spotted deer, various species of mongooses and a whole host of birds including Sri Lanka’s largest bird, the adjutant stork. 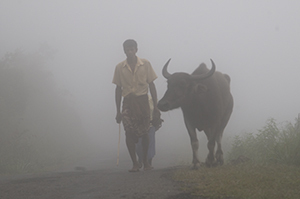 Hopefully we will be reporting on more work in Sri Lanka later this year, as well as the findings from this study. 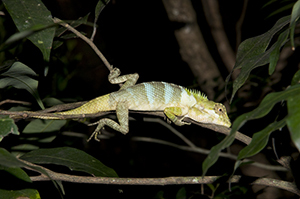 The quite rare Calotes liocephalus. 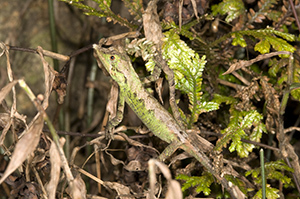 Juveniles are quite camouflaged and often found on the forest floor (adults are mostly arboreal). Male Ceratophora tennenttii. 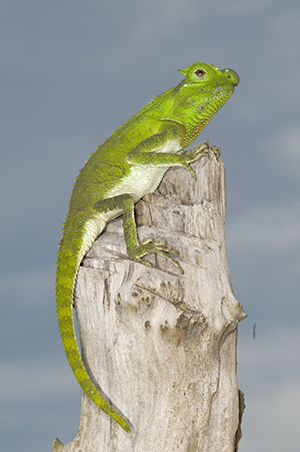 Unlike anoles and many other arboreal lizards they face up the tree. 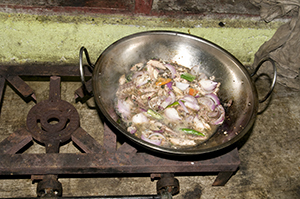 The makings of a fish curry. 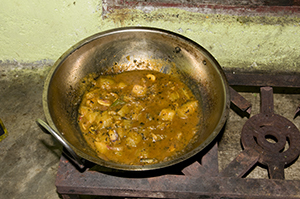 The makings of a potato curry. Ruchira in a feeding frenzy! The very cool Cyrtodactylus soba. 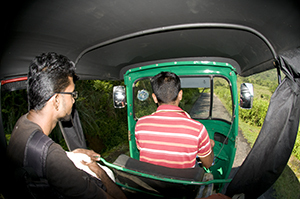 On one occasion we had to take a three-wheeler to the field. Nayana and Ruchira collecting habitat data. 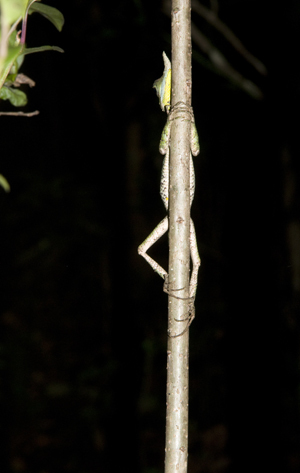 This little guy (Calotes liolepis) was not happy about being woken up and bit us hard, and repeatedly! 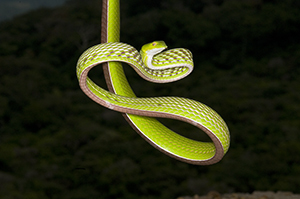 The green vine snake (Ahaetulla nasuta). 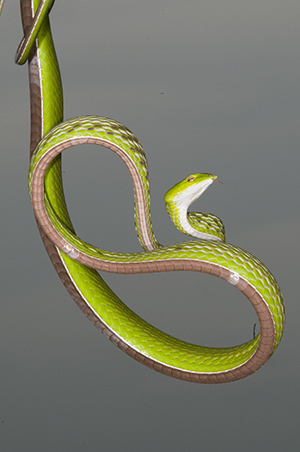 Our one and only snake, the green vine snake (Ahaetulla nasuta). Measuring habitat light. Photo: R. Somaweera. Measuring habitat light (it wasn’t actually dark!) 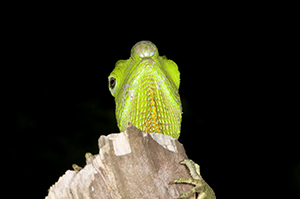 with a leaf-nosed lizard in the foregound. Photo: R. Somaweera. 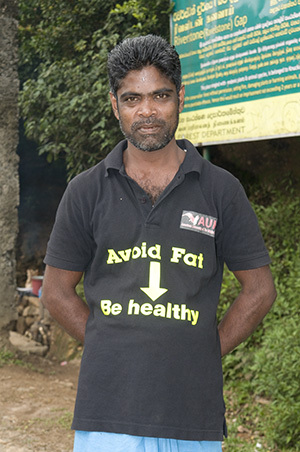 Who said that Sri Lankan cooks aren’t healthy? Elephant in Wasgamuwa National Park. Lets put our heads together. Day 1 and a very bloated leech lies somewhere on the forest floor. This is what happens when a leech penetrates your defences. The very cool Lyriocephalus scutatus. They have a blood red mouth to boot, but they are loathe to open it! Lyriocephalus scutatus, one of the most chilled lizards you could ever hope to meet! 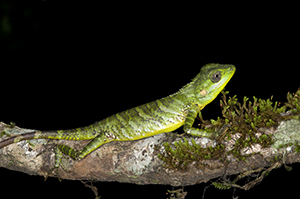 One of my favourite Sri Lankan lizards: Lyriocephalus scutatus. The very cool Nannophrys marmorata, which lives under rocks on shelf rock and which is threatened by habitat destruction.